Need a new pair of boots to hang with your new snowboard? Confused by terms such as flex, features and fit? Never fear as we've gathered all the information that you could possibly need to find the right pair of boots for your mountain adventures. When you are looking at buying you first lot of snow gear, one of the most important things to get right is your boots. It’s the one item that people are advised to purchase even when still hiring that board from the rental shop, after all, you want ultimate comfort whilst pushing the rest of your body through its limits. Snowboard boots can decide how long you stay on the mountain, should fit comfortably and correctly as this could ruin your holiday. It might be worth keeping in mind that it does pay to spend a little bit more money and time getting the fit right. It’s also worth remembering that different brands will fit slightly differently. If a size 9 fits you in Burton, it may not be the same in a Salomon boot. With snowboarders now learning that comfort and support is now one of the keys things when buying a set up, the board may look nice but if your boots are not giving you the support and comfort to keep you going all day then you are going to be in for long trip. The fit on your boot should be quite snug but not to the point that it causes you pain or discomfort. They tend to need a few days worth of wear for them to mould to the shape of your foot. Similar to when you buy a new pair of trainers and it takes a day for them to feel comfy, snowboard boots have a lot more padding and take slightly longer for them to pack out. Your toes should just be “kissing” the end of the boot but you should still be able to wiggle them. It may feel a bit strange to have your toes right at the end but once you lean into the boot you should find your foot slides back slightly and your toes away from the end. Heel hold is another important factor when trying on boots. When leaning in to what would be a toe edge turn, your knee is driven forward but your heel should not move or have any form of lift. A common mistake people make is the myth that you have to go a size up from your normal shoe. This can cause a number of problems on the slopes with such things as twisted ankles and heel lift. As the boot starts to give in you will end up with something that offers hardly any support. 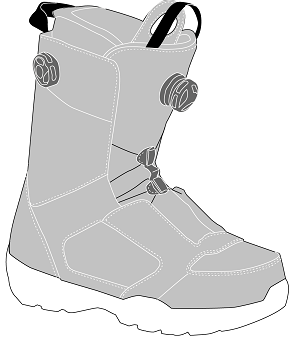 Most snowboard boots are listed in a general size but it can vary from brand to brand. 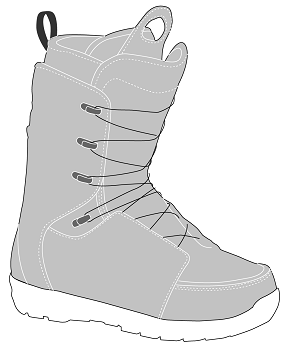 For an example, the outersole on a Thirty Two boot may slightly smaller than the outersole on a Burton boot. Some brands like to make a low tread/low profile boot, which means the boot is designed smaller and more like a trainer, meaning that the rider can use a narrower board and smaller binding. Please bare this in mind when putting your package together. The size of your boots will determine whether you need to go for a standard or a wide board as a large boot overhang is something that cannot be fixed once you are up the mountain. Now, a lot of people are still under the belief that socks are still big thick wool things, similar to the scarf your Gran got you last year for Christmas. The most common thing heard whilst trying on boots is “ but when I am wearing my thick socks it will be fine” so getting the right pair of socks will benefit you when you are carving up the face of the mountain. Socks made of merino wool and synthetic materials keep you warm but also wicks moisture away from your feet giving you ultimate comfort and keeping you dry. Cotton socks are a big no and should be avoided. They do not draw moisture away from your feet, resulting in a damp, cold and uncomfortable feeling. A lot of people think that wearing two pairs of socks will give them extra support and protection from the cold, they couldn’t be more wrong. Having two pairs of socks on your feet can basically cause friction and possible blisters. It can also reduce your feel and response with the board and snow. The thick outer of the boot added with the insulating foam will provide a plentiful amount of protection for you. The flex on snowboard boots is rated from soft all the way up to stiff. Boot flex comes down to personal preference. The softer boots are usually worn by park riders as it allows the boot to have a free range of motion, great for landing tricks. For the more advanced rider a stiffer boot is used as it allows better edge control whilst flying down the mountain at speed. Most brands will give a number rating that ranges from 1 -10 with 1 being the softest and 10 being the stiffest. Most beginners tend to look at somewhere in the middle for their first boots as you benefit from having the best of both worlds. The age old debate of what’s better, traditional or boa system is still going on to this day and there is no right or wrong just personal preference. Traditional laces do offer you 100% control on how you do your boots up and how tight you wish them to be. This tried and tested option has been a stable part of the snowboard boot since the early days but they can be a little hard on the hands during the cold weather should you need to tighten throughout the day. A lot of snowboarders do still stick with this lace up system as it is easy to fix or replace should anything go wrong on your trip. DOUBLE BOA – Placed at the sides of the boot, this adjusts the upper and lower area of lace. TRIPLE BOA – Similar to the double system but has an extra ratchet for adjusting the inner liner. The quick pull lacing system is somewhere between traditional laces and Boa system. It has the ability to tighten the two separate areas nice and quick and you still don’t have to take your gloves off. It focuses on the forefoot and the ankle to give you maximum support whilst riding whilst using a pull and lock style holding. Unlike the Boa system, should something go wrong on the mountain these are a lot easier to re-thread and fix. The final option is the Hybrid system. This combines the quick pull lace on the liner of the boot whilst having the Boa system for the outer giving you the best of both world in comfort and support. 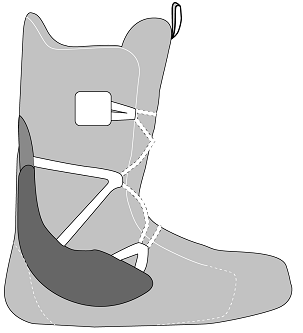 The Liner, usually removable, is one of the most important components of the snowboard boot. It provides the insulation to keep your feet warm but also adds the cushioning to the boot making you feel comfortable throughout a whole days worth of shredding. Made out of Ethylene Vinyl Acetate which is a mouldable and lightweight material, most liners are removable making it easy for quick drying. 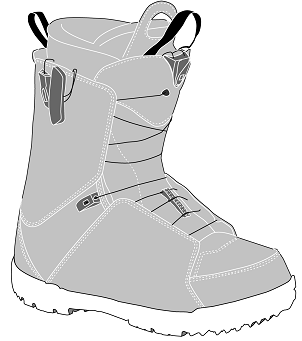 There are three different liners that are used throughout snowboard boots on the market. The first is a standard stock liner which provides entry level padding and stability. The next liner up is the Mouldable inner which is built to mould to the shape of your foot using your body heat. The final liner is found in the higher price point boots, the Heat mouldable liner provides a custom fit for your feet. 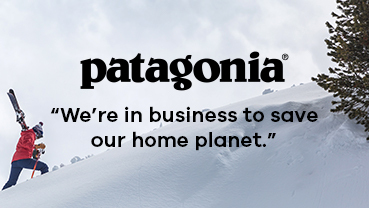 This is something that can be sorted out when you get into resort or at your local snow shop before you head out. If you are looking to increase your comfort level in your boots or you need some extra support it is worth noting that orthopaedic footbeds can be added. This is something that can brought separately and can be transferred from boot to boot as you progress. No one likes to put on cold wet boots in the morning as this can give you a terribly uncomfortable time on the mountain. Drying you boots out can actually increase their lifespan working out better for your wallet in the long run. Please remember that taking the liners out and placing them directly onto a radiator can coz the ethylene vinyl acetate to warp and even melt, making your boots pretty much ruined from that point. The best advice we can give is to simply remove the liner when you get in from a hard days shredding and leave them open in a dry place to breathe and dry over night. By the morning they will be free from any damp and ready to go. Now you know what to look for when buying your new boots go start shopping and remember, don’t just go for the boots that look the coolest as they might not have the characteristics to suit you…See you on the slopes.